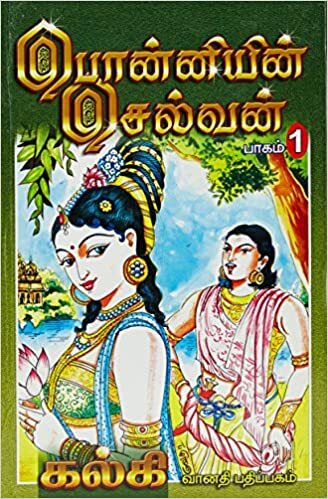 Hello all, Just thought of sharing this Epic novel in Tamil language as,the majority of the people in Tamilnadu are the ardent fans of this book.I am not an impassioned reader of any books before reading this Tamil Epic Novel. The value of this book actually created an interest in me on reading books, of course still I am not a bookworm :), if any book gathers attention on my interest, I would be glad to spend some time with that . Allow me to start spill the beans on Ponniyin Selvan, it is penned by famous Writer Kalki and it was Publised in the year 1951 – 1954. Kalki fused the narration with historical Characters with evidence & a right propotion of fictional characters that actually creates an imagination to the readers to Visualize Tanjore at their mind. Kalki travelled to Srilanka many times to gather the Historical evidence before embarking on this novel. Kalki wrote this novel in Five volumes with 2400 pages and it took more than 3 years for completion. 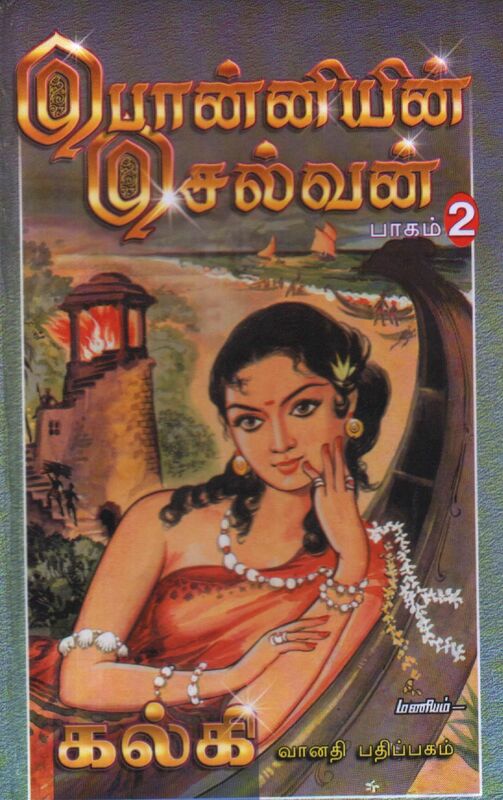 Ponniyin Selvan is a collection of all these genres – History, Family, drama, Romance, Rage, Comedy, Betrayal, Thrill, Courage, fun, spy and will not let you close the book for its Suspense element. I Would call this as a “Political Thriller” as it is not about Battle.The twist and turns in every episode will make you curious on what is going to happen next. 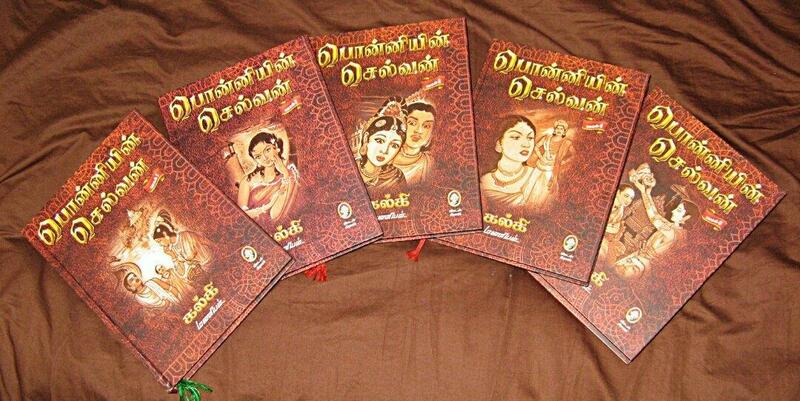 I have read few other story books in Tamil, but none of the books have created an interest like Ponniyin Selvan. Let me share a snippet of Ponniyin Selvan, Its a Story about the King Arulmozhi Verman in Chold dynasty in 10th and 11th Century , Later he was called Raja Raja Cholan who built famous Tanjore Temple. let me throw some lights on some of the interesting and Powerful Characters in the novel. Vallavarayan Vandhiyathevan – Kalki starts his narration introducing him as the protagonist of the novel as, he is the central character touches all other characters in many places in this Novel. He is brave and brilliant young man who was sent to deliver a message to the King in Tanjore . Vandhiyathevan is a fun loving guy, capable of handling any situation by his quick witty and intelligence. Ponniyin Selvan alias Arulmozhi Varman – The Charming Prince of Chola Dynasty and the Title Character being introduced into the novel almost in the middle as he got stuck up in a Cyclone and Pazhuvettairayar in search of him after the disaster . Parallely kundavai trying to meet him through Vandhiyathevan. Kundavai – Kundavai is the elder sister of Ponniyin Selvan, Princess of Chola Dynasty. The Author portrays Kundavai as one of the Most Intelligent and Powerful women in the Chola dynasty as she always think about the welfare of the kingdom, People & their wealth and Future. She is one of the most beautiful women in the Novel and Kalki compares her beauty with godliness. 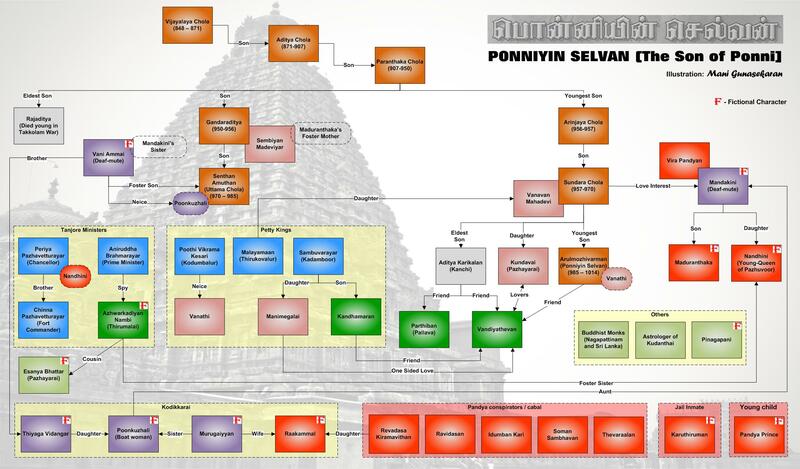 She draft a secret plan through Vanthiyathevan for a meeting with Ponniyin Selvan. During this Phase, her Love story with Vandhiyathevan is also beautifully portrayed. Nandhini – Nandhini belongs to Pandya Dynasty and Marry Pazhuvettaraiyar for a reason. This character is one of the powerful fictional character in the Novel and it doesn’t have any history connected to it. She is one of the Antagonist in this novel, yet another beautiful woman next to Kundavai and Cunning Intelligent Women capable of Seducing any men. Kalki Compares her beauty with the Charming devil as she seems to be soft spoken women, but fire at heart to destroy the Chola Dynasty and execute her plan through Pazhuvettaraiyar. Azhvarkadiyan – Azhvarkadiyan is the honest Spy,yet another fictional character in this Novel and author portray him as a follower of Lord Vishnu and frequently fights with the followers of Lord Shiva. He is another Intelligent Character in this novel and brave guy, who helps Vanthiyathevan in many crucial Situations. A True loyal disciple of Aniruthabrahmarayar. He is also portrayed as a foster brother of Nandhini. Aniruthabrahmarayar – A honest and Intelligent Prime Minister in the Chola Kingdom and right hand of Chola king, as the king never takes any major decisions without consulting him. Azhvarkadiyan is a Spy who works for him.Minister helps Kundavai in a crucial situation to meet Arulmozhi Varman. Pazhuvettaraiyar – He is the leader of Chola Kingdom’s Army and performs all the Conspiracy to capture Chola dynasty. He is being depicted as a brave, old and Strong Warrior and his age close to 60 and married to Nandhini, :). Nandhini uses her beauty to seduce Pazhuvettaraiyar and try to fulfill her wishes through him. There are many other characters pinch in the middle and the plot related to that character with interesting situation elevates this story to a new level. There are so many sub plots that might catch the attention of readers while reading this novel. Let me share some bits and pieces of the story in one liner – The story starts with the Conspiracy from Pazhuvettairayar – Vanthiyadevan meet Pazhuvettairayar through his friend – Nandhini and Kundavai’s clash – Vanathi’s love story – Arulmozhi Varman’s Entry in Srilanka – Vanthiyadevan and Arulmozhivarman Friendship – Aditha Karikalan’s episode in Kanchipuram and many more episodes to go with intense suspense with a twist . Here are some of the relationship,conspiracy and counteract tale happens in the Novel . There are more of these kinds …….. Just shared only few !!! What is relation ship between Aditakarikalan and Nandhini and why he wanted to meet her ? What happend to Arulmozhi varman in Srilanka and whether he survived the Cyclone and who was with him ? I just outlined the main characters in this novel as they are ones drives this story to a extra-ordinary thriller. 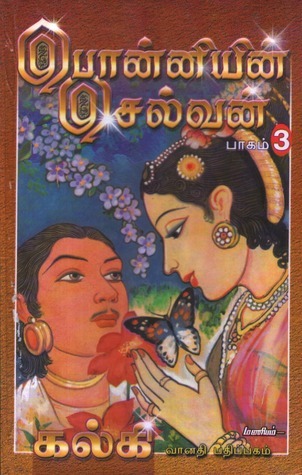 My favourite characters in the Novel are Vandhiyathevan and Nandhini. 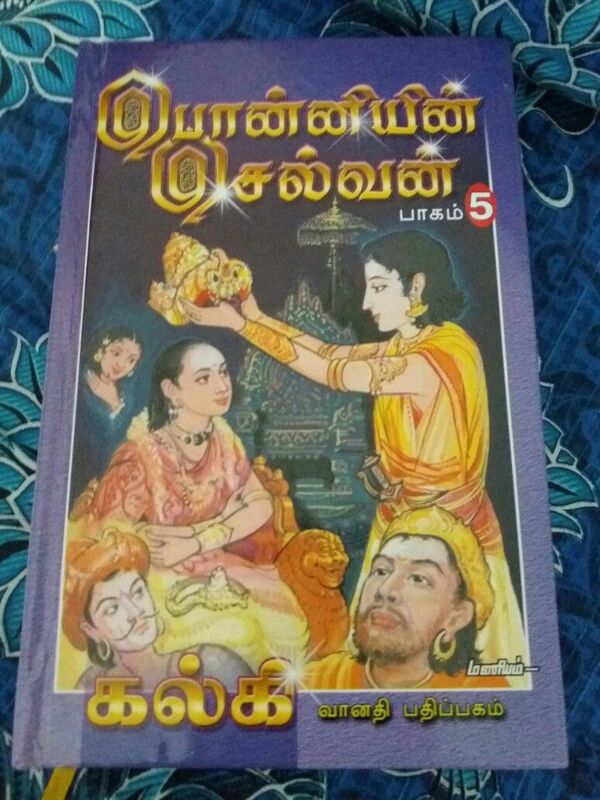 The book in tamil is easily available. This book is being sold like a piece of cake in book fair happens in the Month of January every year. English version of this book is available in Amazon. Characters in the Novel and how they are connected to Each other. Posted in BookTagged Book, fiction, History, Kingdom, Politics, ThrillerBookmark the permalink. Hi, Thank you so much.. are you from Tamilnadu ? Nice 🙂 Happy to get you in WordPress ! Sure, Even I m from Chennai ! Intriguing. I’ve read snippets here and there. Hope to complete reading the full story. Yes.. one of the best political thrillers I have ever read and still no other books created such an impact . Excellent ! One of the epic political thriller created such an Impact for me , but it doesn’t happened for any other books .. Enjoy reading and share your views on Udayar also . Thanks for sharing your views. one of my favorite novel but still not completed. Happy to see such blogs here. Thank you ! I have completed reading this novel couple of times, still if I start an another read, it won’t be boring .. it has such a speciality !